There has been some discussion and concern locally about the incidence of New Zealand Flatworms in Cromarty, what damage they can do, and what can be done to eradicate them. Unfortunately this serious pest is present in town gardens in considerable numbers, and can have a very serious impact on the population of beneficial native worms, and hence on the health of the soil. The NZ flatwork looks very different to our own native worm. The New Zealand Flatworm, (Arthurdendyus triangulatus), was first sighted in Northern Ireland in 1963, and was probably brought there living in the root-ball of a potted plant. Since then it has spread to almost all parts of the UK, but is most commonly found in Northern Ireland and Scotland. 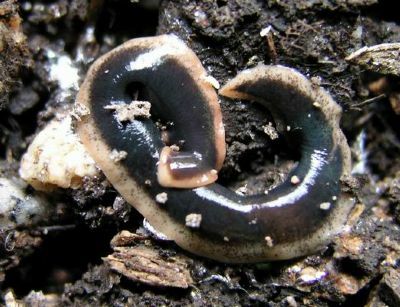 The NZ flatworm seems to prefer damper conditions, so causes less damage in drier areas or drier soil. It appears to like sheltering under flagstones, paving, stones, etc in gardens, and a useful way of trapping them for destruction is to lay 1 foot square pieces of black polythene on bare ground held down with a stone or brick. If you check these after 24 hours or more you'll find one or more flatworms sheltering underneath. Egg capsules (small black shiny ovoids) are often quite numerous in these spots if an area is infested. These can easily be picked up in the treads of boots and wellies, so it's a good idea to clean your boots thoroughly after working in your garden, and especially before visiting someone else's garden. Although some research is currently being done into their natural predators (not enough due to minimal funcing), at the moment there is no known treatment for eradicating these worms. The best you can do is trap them, kill them by squashing, crush any eggs you find, and avoid swapping pot plants with others unless you are absolutely sure that the pot and rootball contains neither worm nor egg.